Who didn’t ask the same old question, gazing at the stars: Is there a life up there? Aliens, cute and friendly or determined to exterminate the human race, flying saucers, spaceships and brave astronauts have been a source of fascination and endless obsession among the boys of all ages. These cute aliens definitely came to here to establish a close contact with the tiny, teething Earthlings. Chan Pie Gnons are soft, soothing, phthalate-free teethers, handmade in French Alps. 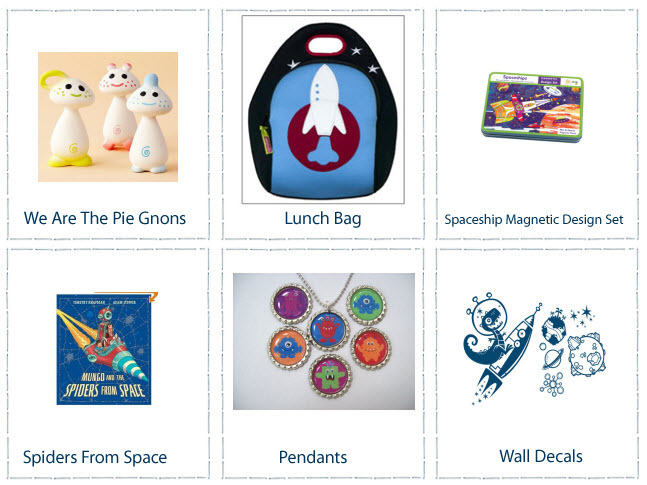 Pack the fuel for your little rocket in space style! Dabbawalla’s striking lunch bags are crafted from eco-sponge, an innovative neoprene-like fabric that has earned the rigorous Oeko-Tex 100 standard of safety in textiles, an ecological certification process that tests for over 100 harmful substances. The insulated fabric is stain-resistant and helps retain food temperatures. Dabbawalla have no corners to host annoying crumbs and they are completely machine-washable! Not to mention how light and easy they are for kids to carry around. In this age of creativity and individualism, a boy is entitled to his own customized Spaceship! This is where Mudpuppy Spaceships Magnetic Design Sets comes into the game providing hours of portable fun. A hinged tin holds 4 illustrated background scenes on 2 double-sided cards plus 3 sheets of interchangeable magnets. Magnets adhere to the tin for fun at home or on the go. The adventures of brave Mungo and evil Dr. Frankenstinker will sure elicit happy giggles from your little space warrior. Warning! He will make you read this book so many times, you’ll start harboring negative feelings towards innocent, heroic Mungo. Cool boys’ necklaces are hard to find. These colorful inch ball chain necklaces with flattened bottle caps and not so scary little monsters in the center will make perfect party favor for the space and alien themed boys’ birthday party. These decals fuse two boys’ obsessions: space and dinosaurs. Who said dinosaurs couldn’t ride rockets?